Randy is the Director of Coaching Education for the Road Runners Club of America (RRCA), directing the national coaching certification program. Past-President of the Southern Arizona Roadrunners, Randy is also the race director for some of Arizona’s most popular events: the TMC Saguaro Labor Day 8 Miler, TMC Get Moving Tucson Half Marathon & 5k, TMC Sunrise at Old Tucson, TMC Be Tucson Women’s 5k, and the TMC Meet Me Downtown 5k Night Run. and fun experience on protected bike paths. Go to www.rotarytourdecookie.org. Rotary friends. Contact Dave Gallaher for all the details: dave@tucsonindustrialrealty.com. 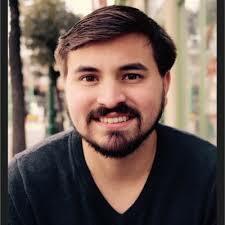 Zach Yentzer will be presenting a talk on "The Whole City- my experiences seeing how the diverse topics of housing and entrepreneurship and brain drain and others all connect, to make Tucson a place where we can spend 36 years, not just 36 hours." The Creative City Show shares the stories and strategies of the people and ideas shaping Tucson's future. Highlighting organizations and individuals who are excelling at bringing people together, mentoring the next generation, and investing in ideas that impact. Invested city advocates and decision-makers who want to keep a pulse on the present and future of Tucson are listening, and being listened to! Join us this week for a presentation from Jason Robinson, Financial advisor with MassMutual. Jason will be discussing his experience with modernizing boards. During his 2 year time in the Chair role for Junior Achievement, he encouraged the board to look at all aspects of the organization through a different lens. He had them analyze if they are being as efficient as possible. He will discuss principles that fit within this fast pace and quick to disconnect world. He will share specific examples of relooking at how a board is run while never forgetting the mission of the organization. ROTARY, HOCKEY AND SERVICE!!! Does it get any better than this!!! The Rotary Club of Oro Valley has partnered up with IMPACT and the Tucson Roadrunners to host a food drive on Friday, December 7, 2018, at 7pm in the TCC Roadrunners Hockey Arena. The Roadrunners incredible CEO, knowing the amazing work Rotary does around town, has offered this special link (attached below) with discounted tickets if you would like to come out for the game, fellowship and of course, FUN!! Fellow Rotarian's, throw on your club shirt and come out and play, lets fill this stadium with Rotarian's and if you are interested in participating in the food drive, please bring out a can of food for IMPACT! We have press covering this event and want to get clubs in attendance mentioned at the game!! October 10, 5 - 7 PM at the Westbound Bar in the Mercado San Agustin Annex. Agustin Kitchen will cater appetizers. Westbound Bar at MSA annex will give $1 off all well drinks. Cost: $5 at the door. RSVP to Jay McCall zonacatmail@gmail.com. This event follows the Rio Nuevo Tour. However, these are separate events: No need to go on the bus tour to join in the fun afterwards. Don will be speaking about Shelterbox USA and his role as an ambassador for the program. Donald G. Jorgensen, Ph.D., CEAP is the owner of Arizona-based Human Factor Consulting. With over 25 years as a business owner and consultant in the areas of change leadership, conflict management, and behavioral health, Don helps bring out the best in leaders and organizations around the globe. Don’s known for his humor and a straight-forward style as an international speaker and has been interviewed in the US, Ireland and China on alcohol & drug issues and crisis response. Don has authored numerous articles and books covering such topics as Children of Alcoholics and The Impact of Change. His “EAP Buyers Guide” has been adopted for use worldwide. 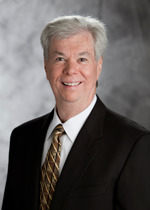 Dr. Jorgensen is past president of the international Employee Assistance Professionals Association, Greater Tucson Leadership and the Rotary Club of Marana. He is a Paul Harris Society member and currently serves as an Ambassador for ShelterBox USA. Don and his wife Kathy have lived in Tucson, AZ for over 30 years. Don and Kathy have worked on humanitarian projects around the globe, including South Africa, Zimbabwe, and Brazil. Don is a cancer survivor, has completed 2 marathons and currently holds a 3rd Degree Black Belt. Don was recently honored with the “Lifetime Achievement Award” from the international Employee Assistance Professionals Association. We've got an exciting month ahead of us. Two meetings, a tour of the Port of Tucson, and a mixer with the Pantano Rotary club. To start it all off: We have a very special guest this week: District 5500 District Governor Kirk Reed will be joining us as our guest and featured speaker. Read more about Kirk below. Please plan to arrive between 11:45 - 11:55 AM to have time for food and socializing prior to beginning our meeting at 12 PM. Also, Stay tuned on the website and keep an eye out for club runner e-mails: We will be looking for attendees to the District Membership Seminar on Saturday, August 11, 8:30 to 12:00 noon, assistance with setting restaurants for the 2018 Passport, and additional volunteer events to come. See you Wednesday, August 1 at Hotel Congress! It's been a while - We've missed you! Please join us tomorrow for a great meeting and opportunity to get back in touch with your fellow Rotarians. Thanks to the July 4th holiday and the rehab last week at Hotel Congress, this will be our one and only meeting for July. In addition to socializing, we will be presenting Youth on their Own (YOTO for short...) with the proceeds from our Valentine's concert fundraiser. 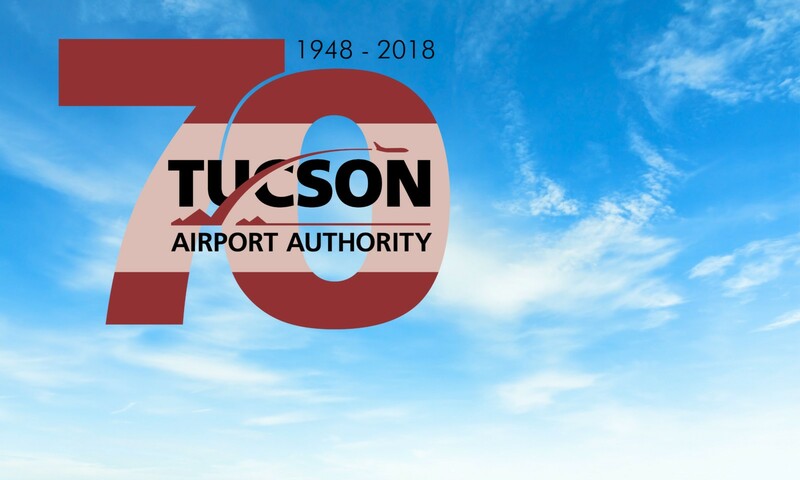 Then, we'll have a surprise speaker from the Tucson Airport Authority to discuss on going development and plans at the Tucson International Airport. Also, please stay tuned on the website and keen an eye out for club runner e-mails: We will be looking for attendees to the District Membership Seminar on Saturday, August 11, 8:30 to 12:00 noon, assistance with setting restaurants for the 2018 Passport, and additional volunteer events to come. See you tomorrow at Hotel Congress! Mia is a former Presidio Rotarian and President and Founder of Southern Arizona Adaptive Sports, a nonprofit providing fitness, recreational and competitive sports opportunities for people with disabilities. Bill will be speaking about the Arizona Corporation Commission. It is the fourth branch of government, and the least understood. Bring questions and come learn about what the Arizona Corporation Commission does and how it's role here in Tucson. Anne Breckenridge Barrett is a cultural professional with over twenty-four years of focused expertise in museums, non-profit management, and the law. 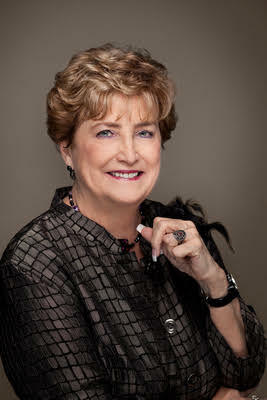 She is a leader in the areas of collections management, exhibition organization, and strategic work for social impact. She is an attorney with broad experience in a range of settings including a large law firm, the Arizona Attorney General’s office, and a variety of non-profits serving in professional and volunteer capacities. Breckenridge Barrett joins the Center from the Museum of Contemporary Art, Chicago, where she served as Director of Collections and Exhibitions. Among her many accomplishments, she helped shepherd and produce landmark exhibitions including David Bowie Is, Kerry James Marshall: Mastry, and the recent Takashi Murakami: The Octopus Eats Its Own Leg. Anne is an active leader in the museum community having strong relationships with curators, artists, collection managers, exhibition directors, and educators, throughout the country and around the world. She presents at annual conferences and universities on a range of topics. She was on the steering committee of the North American Exhibition Organizers, a member of the Museum Attorney Group of the American Legal Institute, and served on the College Art Association’s Fair Use Chicago Committee. Anne is an alumna of the Getty Leadership Institute Fellow and completed the prestigious residency alongside thirty three other museum leaders. She holds a Bachelor of Arts in art history from American University, a Master of Arts in visual arts administration from New York University, and a Juris Doctor from Vermont Law School. At home Anne can be found in the desert of Tucson, Arizona. Her joy is derived from her husband and children along with healthy doses of design, music, yoga, and hiking. Amy has worked in the areas of non-profit management and fundraising for seventeen years. She has been the Director of Presidio Museum for five years, stewarding the growth and development of the Presidio into a sustainable cultural attraction. 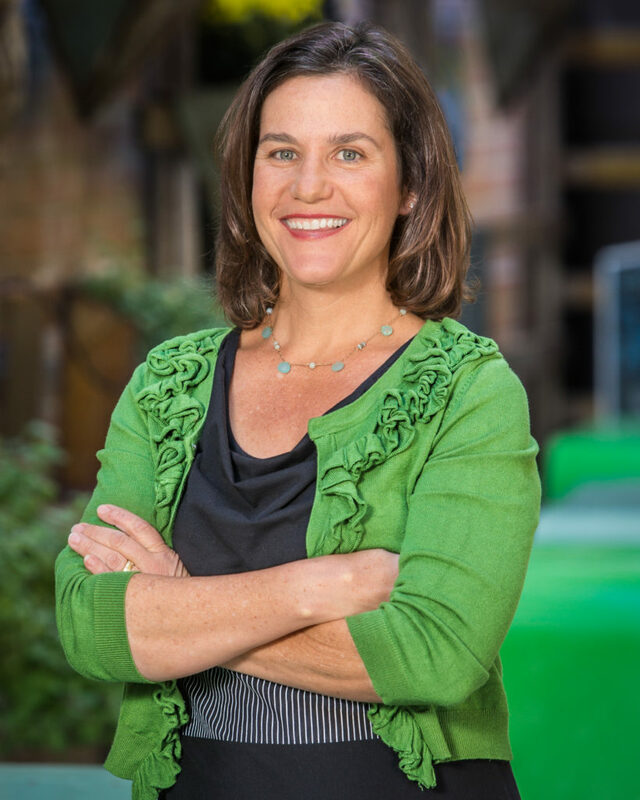 During this time she has overseen the Museum's change in operating agreement with the City of Tucson and has stewarded the development of daily programming to enhance the regular visitor experience. Previously she was Director of Finance for Congresswoman Gabrielle Giffords' 2008 re-election campaign where she managed the initiative to raise over $3 million. Amy has also worked at the Arizona-Sonora Desert Museum as Associate Director of Marketing and as Development Officer where she was engaged in corporate fundraising, group sales, front-gate supervision, oversight of the annual Gala and major donor interaction. Amy has been included in the Arizona Daily Star’s “40 Under 40” list. She has served two terms on the board of the Tucson Children’s Museum and three terms on the University High School Foundation and Alumni Association which has raised over $200,000 in four years. Amy received her MBA in 2000 from the University of Arizona. Wednesday, April 25 - Note: No noon meeting at Hotel Congress this week. 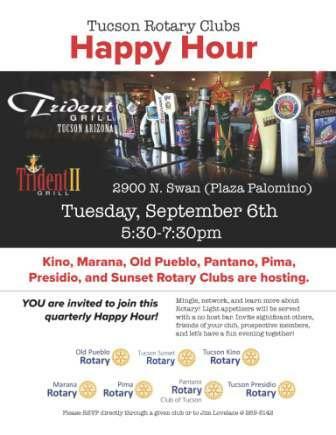 Instead, join the Tucson Presidio Rotary club at our monthly Happy hour! This month we will be visiting and supporting another local downtown business, the Owls Club. 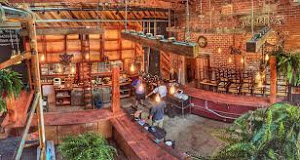 "The Owls Club is an aspirational Western bar located in the historic Armory Park neighborhood of Downtown Tucson. Offerings include an extensive whiskey selection, old world wine list, well-curated spirits collection, and a modest beer program. Nestled inside a 1920s structure decorated with beautiful stained glass and chandeliers, the Owls Club provides a warmth and elegance to the neighborhood bar experience." 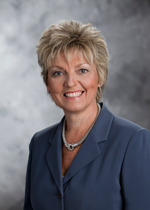 Ellen Kirton spent 35 years in the banking industry, with her last position as a Senior Vice President and Business Banking Manager at Bank One/Chase. Currently, she is counseling, training and teaching as the Pima Community College, Small Business Development Center as its Director. Ellen has adopted as part of her DNA, serving military and veterans. She is so appreciative of her contributions to our freedom. In addition to Boots to Business, she and her team host an annual Veterans Conference with hundreds in attendance. The priority to her is to inform and inspire. Concurrently, she is a co-owner of an Internet-based human resource company. Her community service includes both with professional organizations and charities. She is a past President of NAWBO, sits on the board of the BBB, and is a past president for the Catalina Council of Boy Scouts of America. She also serves on the Ambassador Board of Make a Wish as well as the Advisory Board of our WFG. Ellen served on the board and as President of New Beginnings for Women and Children (now Our Family). She is the author of “Cinderella is Still Dancing” and is a public speaker. In this past 12 months, she was recognized both locally and nationally. She has been twice honored as a “Woman of Influence” from Inside Tucson Business newspaper, next she was chosen as the “State Star” for Arizona and recognized at the ASBDC National Conference in San Francisco. Also, she was given a Lifetime Achievement Award by the Minority and Small Business Alliance. Ellen’s belief is that it important to give back to the community you live and work in to help make a difference for others. 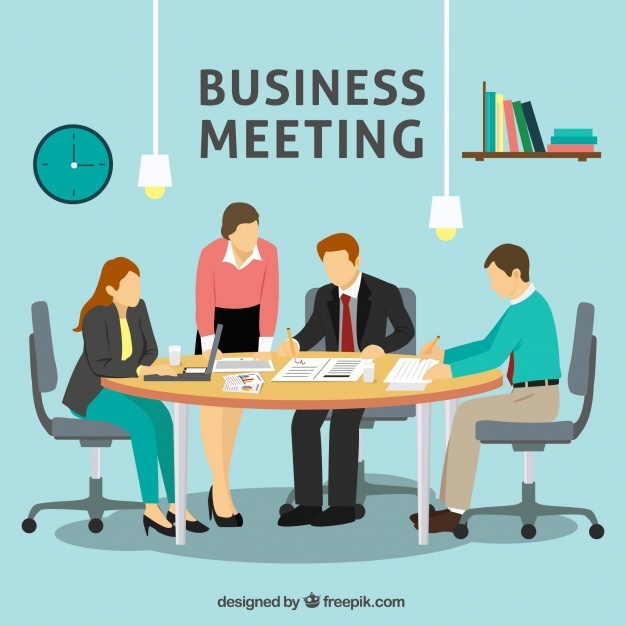 This Wednesday we will be having our business meeting ~ join us and see what we've got planned for the rest of the year! LAST CHANCE to get your Passport Tickets! The Passport Event is THIS WEEKEND!!! Don't miss out on a chance to win a great trip plus $1000.00 CASH!!! Invite your family, friends and coworkers, too. Tickets which can be purchased by calling 520-297-9349 or emailing phc@hwcg.com during business hours. 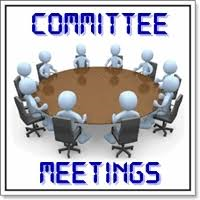 Just a reminder that this week is Committee Meetings ~ no regular meeting. Also, please get out and sell those Passport Tickets! If you need more ~ let Reba know. 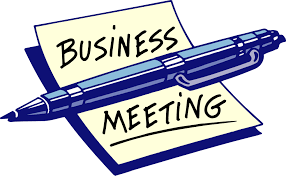 As usual tomorrow will be our business meeting ~ come and see what we've got planned for the rest of the year! There are lots of opportunities to have fun while making a positive difference. Passport 2017 - Tickets available now! The Passport Event is an annual fundraiser where participants purchase a Passport allowing them to visit and sample a specialty food item and purchase a specially priced signature cocktail. Event proceeds benefit local non-profit restaurant Cafe 54. Just a reminder ~ the charity finalists will be speaking to the club on the 19th. We would love to have as many members as possible come to help us pick the most deserving charity. Our charity submissions are in and will be reviewed at the Board Meeting July 12, 2017. The finalists will be speaking to the club on the 19th. Take a look below to get a feel for the charities being considered. Wings for Women assists homeless and impoverished women and their children. With many resources such as housing (rental assistance), utility assistance, clothing, education, furniture (when needed), food, school supplies, car repair, unique medical necessities and any obstacles that are preventing clients and their children from leading productive lives in the community. From Maureen: Every year 62,000 children in Arizona find themselves homeless. Last year 75 Tucson Magnet High School were put in touch with YOTO for help. This organizations helps the students graduate by providing financial assistance, basic needs, employment and one on one guidance. These students become homeless for many reasons, parental abuse, addiction, and many others. If these students are not helped these students are four times more likely to drop out of school and twice as likely to become unemployable adults, trapped in poverty. From the Director: Youth on Their Own (or “YOTO” for short) is a local 501(c)(3) nonprofit agency operating in Tucson and Pima County, Arizona. For over 31 years, our mission has been simple: to support the high school graduation and continued success of homeless and abandoned youth. Services that YOTO provides include: the opportunity for youth to earn a monthly stipend of up to $140 based on academic performance (As, Bs, and Cs) and good school attendance; material assistance such as food, clothing, hygiene items and school supplies; emergency financial assistance with pressing needs such as rent, utilities, or medical bills; transportation assistance; and ongoing guidance and support. Support from the Tucson Presidio Rotary Club would ensure that one or more of the above services is available to a homeless teenager who is struggling with day-to-day survival while also pursuing their high school education. According to a recent report by UNICEF, there are up to 100,000 child beggars in Senegal. Traditionally, in Senegal parents are contracted with Marabouts (teachers) who then raise and provide an education to their children. In exchange for this education, the families would then provide compensation or gifts to the Marabouts. A single Marabout typically has anywhere from twenty to several hundred children in their care. During the day, these children are sent out into the streets to beg for their Marabouts. If they come home with nothing, they are often faced with consequences. These street children are poor, have little to no food, and are being pulled out of school to roam the streets. Although little education is provided by Marabouts, it's not sufficient enough for these children to grow into productive, working members of society. The Forgotten Children are building a boarding school that will hold about 100 kids. This will give these children an opportunity to live safely, while gaining a real education to give them a hope of growing successful to one day provide a living for themselves. Coyote Taskforce does own its buildings, 54 and 66 East Pennington. Our HVAC unit is over seventeen years old and only operates in part of the building (we have a swamp cooler in the Cafe 54 kitchen). As you know, we serve members who live with serious mental illness. Most psychotropic medications make those who take them highly susceptible to the effects of extreme heat. On some days, the temperature in the kitchen can reach 90 degrees; in fact, one of our staff members experienced heat exhaustion just last week after she worked the lunch rush on the line! We take great pains to give our trainees and members plenty of breaks and ensure that they drink extra water, but the best way we can ensure their safety (and that of our staff) would be to replace and expand the existing HVAC unit. Furthermore, with a more energy-efficient model, our monthly bills will be lower and we can funnel those savings back into programming and essential infrastructure support. From Chong: Lutheran Social Services contribute to the quality of life for over 60,000 of our most vulnerable men, women, and children in Arizona. By partnering with other nonprofit organizations, government agencies, civic groups, local business and faith communities we ensure that our cumulative efforts are maximized—inspiring hope and preserving the dignity of those we serve. We build self-reliant foundations through our Children & Family Services. We stabilize individuals and families during times of crisis and transition through our Refugee Focus Services. We preserve dignity and respect for our older adults through our Aging & Disability Services. From Ted: SAJV is a newly organized non-profit corporation with the purpose of raising funds to provide access to justice for Veterans, particularly those alleged to have committed misdemeanor offenses within the jurisdiction of the Regional Municipalities Veterans Treatment Court (RMVTC), which includes Marana, Oro Valley, Sahuarita, and South Tucson. Please recall the presentation by Matt Randle at a Club meeting this spring, and the Club’s contribution of part of the proceeds from the Simon & Garfunkel tribute to SAJV. Our Club was the first service organization to contribute to SAJV. Under the leadership of a Viet Nam era Marine who now is a City Court Judge, Tucson City Court instituted a modified diversion program for misdemeanor offenders who are Veterans. The Court monitors their progress while providing them treatment needed to again become productive members of the community. At the time, the RMVTC was started, there were only 18 such Courts in the county, and the Tucson program was funded by grants from the federal Substance Abuse and Mental Health Service. There are now over 300 courts across the county. The federal resources are diminishing, and so SAJV was created to help fund services through the RMVTC . Money received will help the Court insure Veterans receive needed services such as substance abuse counseling, domestic violence classes, mental health treatment, anger management, and DUI classes. I can’t overstress the trauma some Veterans experience integrating into civilian society after the stress of sometimes multiple tours in the Middle East. This program helps some of those in need. I urge that the Board approve SAJV to be the recipient of funds earned in our fall Passport program. We're creating Vietnamese spring rolls where everyone can build their own. William will show everyone how to do it ~ it's quite a show! People can bring any side they want that goes with an Asian menu.....salad, vegetables, rice, wontons or just dessert! Directions: If you're coming from Wilmot/Broadway, make sure not to get confused with 15th St on that side; we are on the West side of the Sky Islands High School behind the Park Mall. Our house has a stone wrought iron wall, plenty of parking along the street. If anyone gets lost Mona's cell is 520-548-2925. Hope to see everyone there! Executive VP, Kathy Bollinger, and Chief Medical Officer, Dr. John Hensing, will give updates on the new hospital construction and new partnership with Banner and the UA. President Elect Maureen Slack and President Margie Lannon presenting Dan Martin with his 2nd Paul Harris Pin. Great job, Dan! 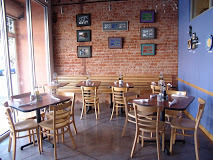 More than an eclectic restaurant located in Tucson’s downtown arts district, Cafe 54 is a unique job development and pre-employment training program for adults recovering from mental illnesses. Cafe 54's award winning program includes pre-employment training for a variety of positions such as line and prep cooks, servers, cashiers, catering, and others. Join us as we proudly present our $4,300 Passport check to Joanna Keyl and hear how Cafe 54 will use it in the coming year. The Service Committee ~ and anyone who'd like to join us ~ is meeting for lunch at Cafe 54. Come join us 5:00 pm to ??? In lieu of our committee meetings this week we will help serve Thanksgiving Dinner to the Seniors at Armory Park. Everyone should meet at 220 S. 5th Avenue at 11:30 am, Wednesday, November 23, 2016. This is a wonderful opportunity to start the holiday season off right! 5th Wednesday of month (months with 5 weeks) – Scheduled mixer with other Rotary groups at various locations. 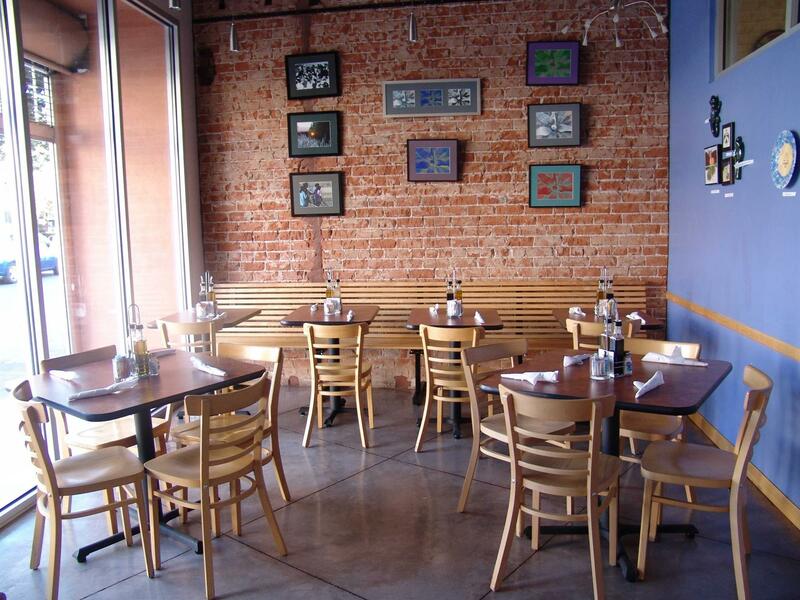 Regular and Business meetings start promptly at 12:00 noon with lunch served at 11:45. All members are required to sell or purchase 20 tickets to either one or both of our fund raising events. 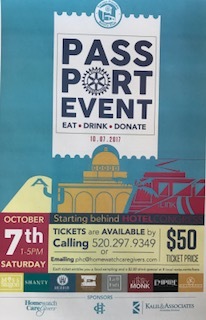 Thanks to the Cienega Vail Rotary Club for buying tickets to our upcoming Passport Event! We appreciate the support! 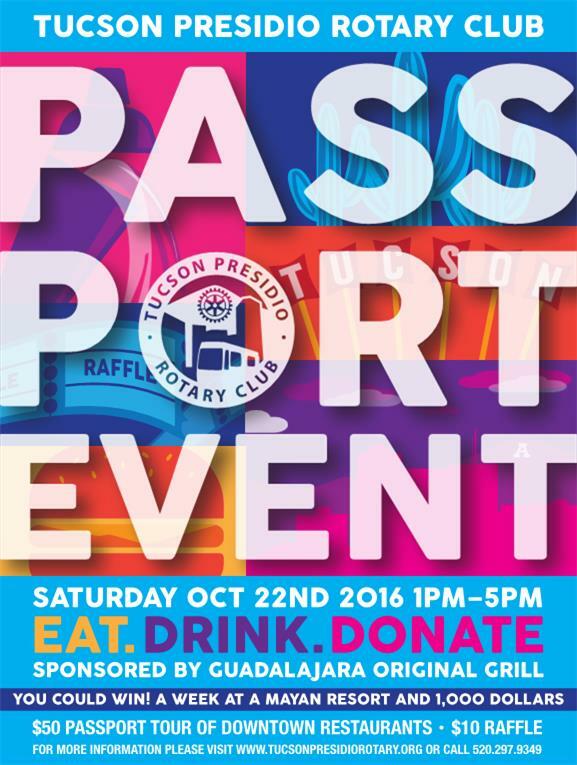 The PRESIDIO PASSPORT RAFFLE 2016 (the “Raffle”) will be held in conjunction with PRESIDIO PASSPORT 2016, a fundraising event to take place in downtown Tucson, Arizona from 1:00 pm to 5:00pm on October 22, 2016 (the “Event”). 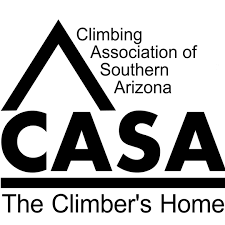 The Event’s sponsor is the Tucson Presidio Rotary Club/Rotary District 5500 (“Sponsor”). 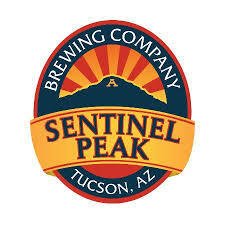 All proceeds of the Raffle will benefit the Tucson Presidio Rotary Club and their chosen causes. RAFFLE TICKET OR PASSPORT PURCHASE NECESSARY: To enter the Raffle and be eligible to win, a person must either purchase a raffle ticket in the amount of $10.00 (“Ticket”) or purchase one admission to the Event in the amount of $50 (“Passport”). A person purchasing a Ticket or a Passport is a “Participant” for purposes of these Terms and Conditions. A Passport entitles the participant to one Ticket for the purchase, valued at $10; if the participant obtains “stamps” in his or her Passport from all restaurants participating in the Event, the stamped Passport entitles the participant to a second Ticket, also valued at $10. Stamps may be any mark made by the participating restaurant in a Passport to indicate that a Passport-holding participant has visited the restaurant during the Event. ELIGIBILITY: The Raffle is open only to citizens and legal residents of the 50 United States and the District of Columbia, who are 18 years of age or older as of October 22, 2016, and who possess a valid government-issued identification. Members of Sponsor are eligible to enter the Raffle and/or participate in the Event. There is no per-person limit on the number of Tickets or Passports that may be purchased, however, no more than 2,000 Tickets will be sold and no more than 250 Passports will be sold. All required information and fields on the entry form must be fully and accurately completed or entry may be voided. Refunds will not be issued. RANDOM DRAWING: On October 22nd, 2016, a winner will be selected in a random drawing from all eligible entries received (the “Winner”). Each Ticket sold constitutes an eligible entry. The odds of being the Winner depend on the total number of eligible entries received, which shall be no greater than one in 2,000. PRIZE: Subject to the provisions contained in this Agreement, Winner will receive a one-week stay for up to 4 people at The Mayan Palace, Rocky Point, Mexico, subject to available vacancy, to be used by December 1st, 2017 (the “Prize”). No other elements or expenses are included in the Prize, and specifically excludes, among other elements and expenses: beverages, entertainment, travel insurance, unspecified ground transportation, rentals, phone calls, gratuities, incidentals, souvenirs, gasoline, all personal expenses of any kind or nature, together with any necessary overnight layover expenses, and all such expenses are the sole responsibility of the Winner. Any visa, travel, immigration, or vaccination requirements which the Winner is required to meet to use the Prize will be the sole responsibility of the Winner. Winner is responsible for scheduling reservations for the Prize and may also be responsible for taxes, additional tickets, or other expenses associated with booking the stay. Notwithstanding any contrary provisions contained herein, by becoming a participant in the Event and/or Raffle, you hereby agree and acknowledge that Sponsor and all of Sponsor’s successors, predecessors, related and/or affiliated entities, and all officers, directors, employees, representatives, and agents thereof (together, “Sponsor’s associates”) make no guarantee nor promise whatsoever regarding the Prize, including, but not limited to, Winner’s ability to utilize or use the Prize. If the Sponsor is unable to transfer the Prize to the Winner or the Winner is unable to utilize all or part of the Prize for any reason, the Winner hereby agrees and acknowledges that i) no substitute prize will be given, ii) Sponsor will not compensate the Winner for the fair market value of the Prize, and will not reimburse Winner for the cost of the Raffle Ticket(s) or Passports purchased. NOTIFICATION: Winner need not be present at the random drawing. Winner shall be notified at, or as soon as practicable after, the random drawing. Before Winner can claim the Prize, he/she must complete, execute, and return as directed an Affidavit of Eligibility and Release of Liability within 10 days of notice of being the Winner. Failure to comply with the requirements of this paragraph may result in disqualification and in the forfeiture of any right to the Prize, in which case the Prize may be awarded to an alternate winner by random drawing or revert to the Sponsor for use at their discretion. 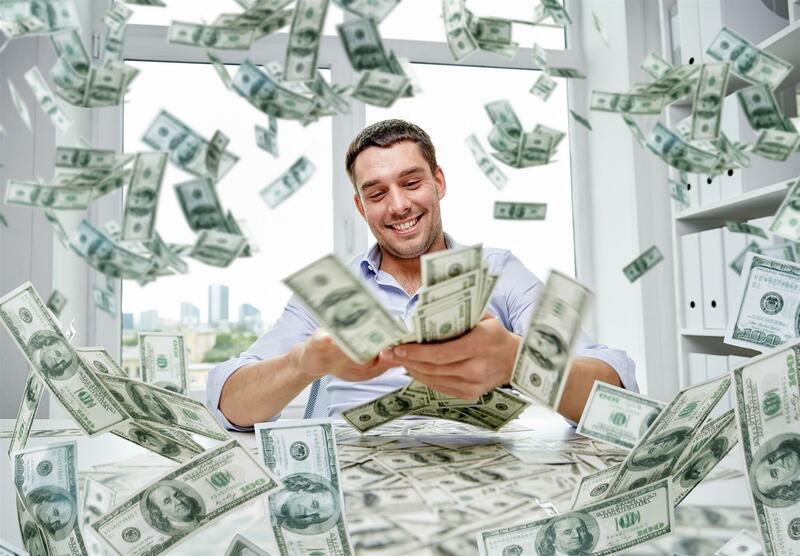 TAXES: Winner acknowledges and understands that any and all federal, state, and/or local tax liabilities arising out of the receipt and acceptance of the Prize are Winner’s responsibility and are not the responsibility of Sponsor. Winner further acknowledges that he/she will be required to sign and deliver to Sponsor an IRS Form W-9 in connection with the receipt and acceptance of the Prize. The Prize may constitute taxable income to the Winner, and Sponsor may file appropriate reports of income to relevant revenue authorities. Sponsor shall deliver a copy to Winner at the mailing address Winner provides in the Affidavit of Eligibility and Release of Liability. TRAVEL/ACCIDENT INSURANCE: Winner acknowledges and understands that Sponsor has neither arranged for nor carries insurance of any kind for the benefit of Winner or any person travelling with Winner, or for his/her heirs, executors, and/or administrators concerning the use of the Prize. Winner is solely responsible for obtaining and paying premiums for any life, travel, accident, property or other insurance concerning his/her use of the Prize. WAIVER AND RELEASE: By attending the Event and/or entering the Raffle, participants and their heirs, personal representatives, and assigns, completely and forever release and discharge Sponsor, its members, officers, directors, agents, servants, employees, promotional partners, successors, assigns, consultants, advisors, contractors, and representatives from any and all claims, actions, suits, costs, issues, expenses, demands, damages, injuries and/or other liabilities, known or unknown, absolute or contingent, and whether or not fixed, including, but not limited to, personal injury, illness, or death to participant or others, damage to or loss of property of participant or others , which the participant has now or may have in the future against Sponsor resulting in any manner from and/or by reason of attending the Event and/or entering the Raffle, including use of the Prize. INDEMNIFICATION: By attending the Event and/or entering the Raffle, participants agree to protect, indemnify, hold harmless and defend Sponsor from and against any and all claims, suits, demands and/or civil actions arising out of or related to: (1) participation in the Event, (2) patronage of any restaurant participating in the Event, whether during the Event or at any other time, (3) Winner’s acceptance, possession or use of the Prize, including, but not limited to loss or damage arising from any cancellations, delays, inclement weather, act of God, or any act or omission of any third party, including but not limited to The Mayan Palace. SPONSOR’S RESERVATION OF RIGHTS: Sponsor reserves the right to modify these Terms and Conditions at its sole discretion. If for any reason, the Event or Raffle are not capable of being held as planned as a result of, but not limited to, an error, omission, defect, delay, misdirection, tampering, or any other reason, the Sponsor reserves the right to withdraw, cancel, terminate, modify or suspend the Event or Raffle without obligation or prior notice, and in such event to determine the winner via random drawing from among all valid entries received up to the time of such cancellation, termination, modification or suspension. Sponsor may disqualify from the Raffle any participant engaging in any attempt to influence the results of the random drawing by threat, bribe, forgery, intentional loss, destruction, or limitation of eligible entries, or any other improper means. Sponsor shall have no obligation or liability to any participant who is disqualified due for using or attempting to use improper means of influencing the random drawing. The purchase of additional Tickets or Passports in order to increase the statistical likelihood of becoming Winner shall not be considered an improper means of influencing the random drawing. Any failure by Sponsor or Sponsor’s Associates to enforce any provision of the Terms and Conditions contained herein does not constitute a waiver of that or any other provision. PUBLICITY AND USE OF LIKENESS: In consideration of participant’s entry in the Raffle and/or the Event, he/she hereby grants to Sponsor, Sponsor’s Associates, and the designees of both, an irrevocable, world-wide, non-exclusive, royalty-free license to use, reproduce, and/or make reference to his/her picture and likeness (e.g. photographs from the Event) in any manner and in, by and through any media, for any marketing, advertising, or promotional purposes, including but not limited to the Internet, and to maintain such picture or likeness in a database for future use, all without additional remuneration to the participant, to the full extent permitted by law. LAWS: These Terms and Conditions are governed by and construed in accordance with the laws of the State of Arizona. TIME IS RUNNING OUT! Get your Passport and raffle tickets for the Tucson Presidio Rotary Passport 2016 event! 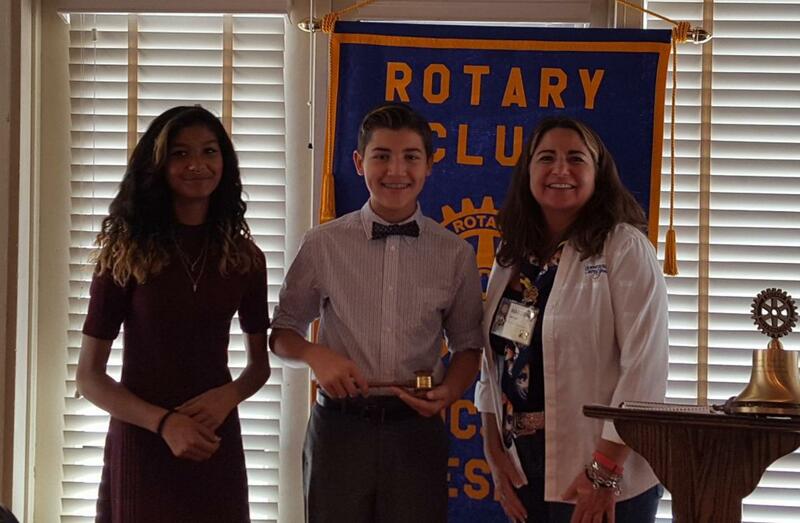 President Margie Lannon presenting a gavel to the President's of the Presidio School Interact Club. 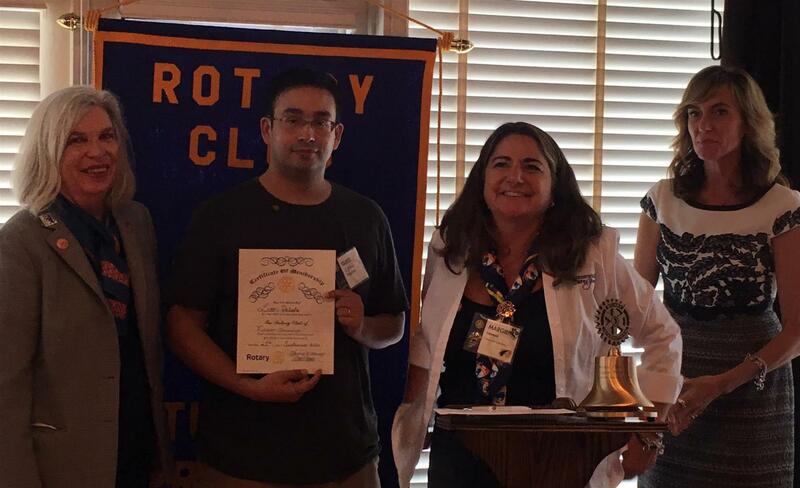 Our newest member, Leon, inducted into the club by the power duo of DG Sheryl Christenson and President Margie Lannon. Welcome Leon! District Governor Sheryl Christenson shared her inspired vision for District 5500 with the Tucson Presidio Rotary on September 21, 2016. Please join us in welcoming our District Governor, Sheryl Christenson. 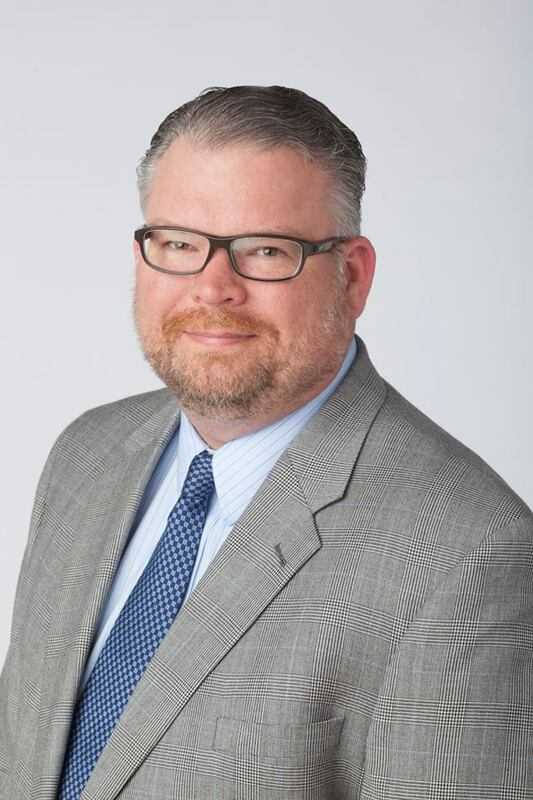 Mark A. Blakeman was appointed President & CEO of the Tucson Symphony Orchestra (TSO) in August 2014 bringing more than eighteen years of performing arts and arts education experience to this leadership position. In his first year, he expanded the TSO’s community partnerships, broadened its appeal through the creation of a new Family Series for the 2015-16 season and joined his colleagues in the arts community to advocate for a bond issue that would, among many other benefits, improve the Tucson Music Hall where the orchestra performs. Mark came to the TSO after more than fifteen years with the Nashville Symphony Orchestra (NSO). During his Nashville tenure, he served in a number of leadership roles most recently as Chief Operating Officer. Under his leadership, the Nashville Symphony achieved a 26% growth in ticket sales, an increase of nearly 70% in contributed income, and record-breaking earned revenues in ancillary businesses. Mark’s extensive experience in electronic media work includes overseeing more than 25 commercial recording projects, which garnered seven GRAMMY Awards®, and over ten national telecasts resulting in two regional Emmy nominations and one Emmy Award. Prior to Nashville, Mark worked at Oklahoma City University’s Bass School of Music as the Director of Student Services and as Director of the Performing Arts Academy, the school’s preparatory community music school. He served as an adjunct instructor at both Oklahoma City University and Middle Tennessee State University, teaching coursework in acoustics, survey of American popular music and orchestral music and management. He has served as a clinician at the Tennessee, Oklahoma and Texas all-state music conferences, lecturing on concert production and artist engagement. Mark holds a Bachelor of Science degree in Music Business from Middle Tennessee State University (MTSU) and a Master of Business Administration in Arts Administration from Oklahoma City University. In 2008, he was recognized as a distinguished alumnus of MTSU’s College of Mass Communications.